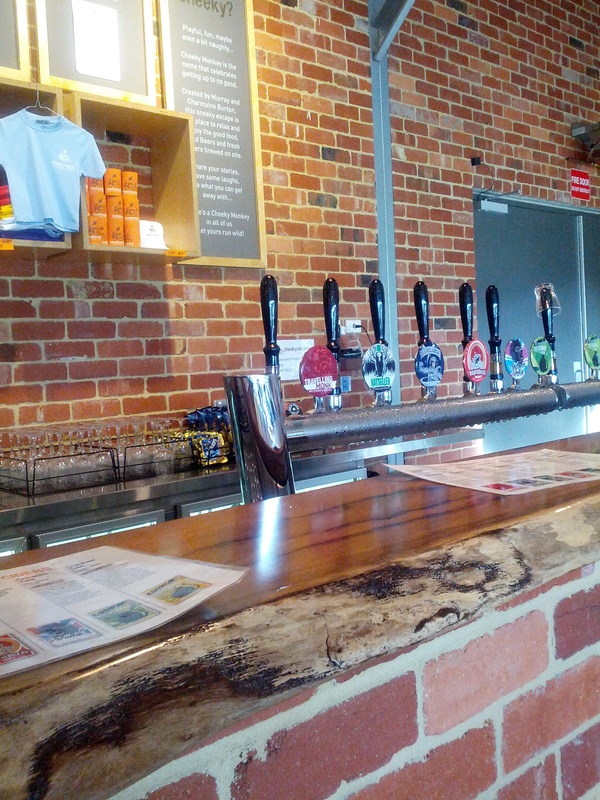 Cheeky Monkey Brewery & Cidery is the latest edition to the growing number of craft breweries who call the Margaret River, predominately known for being a wine region, their home. 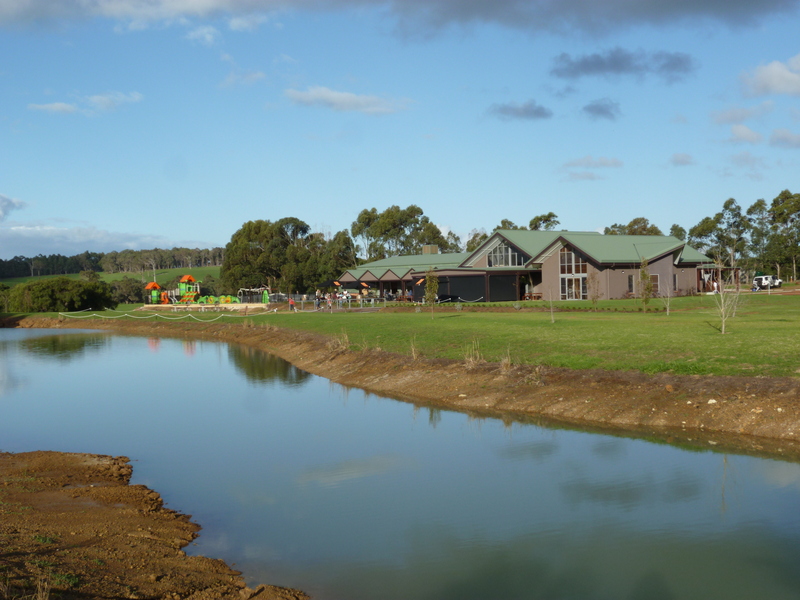 They opened in early May after a few hurdles regarding fears of yeast contamination with neighbouring wineries but judging by their Facebook page and the many happy smiling faces I saw, they have been a welcome addition to the region. Last weekend my boyfriend and I decided it was about time to check it out so we jumped in the car and headed towards Margaret River. On the way we realised we were coming up on Puzey Road and the irresistible allure of a stopover at Bootleg Brewery was too much to refuse! We couldn’t have chosen two more different Bootlegs to indulge in. Whilst my boyfriend opted for his favourite, Black Market IPA, I went for the new Bootleg Apple Cider (5% abv); it’s crisp and bitter and very Granny Smith apple and it might seem strange but one of the things I liked the most was the fact it wasn’t overly carbonated, making it easy drinking rather than feeling full from just a glass. The Black Market IPA, as always, was as good as ever. 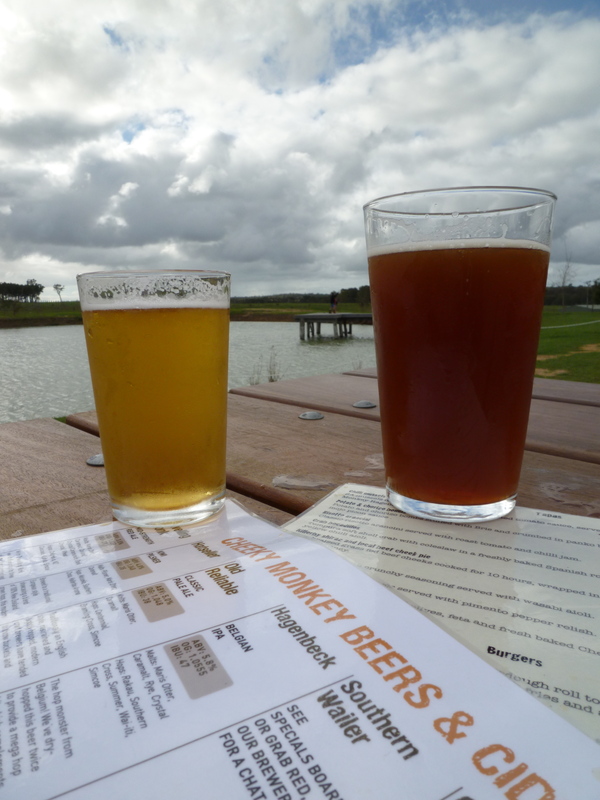 With a visit to the first microbrewery in the Margaret River wine region under our belts we did a hop, skip and a jump to the newest – Cheeky Monkey Brewery & Cidery. It was apparent when we drove in that we would need to park in the overflow parking. Having parked a fair distance from the brewery, a few things became apparent. 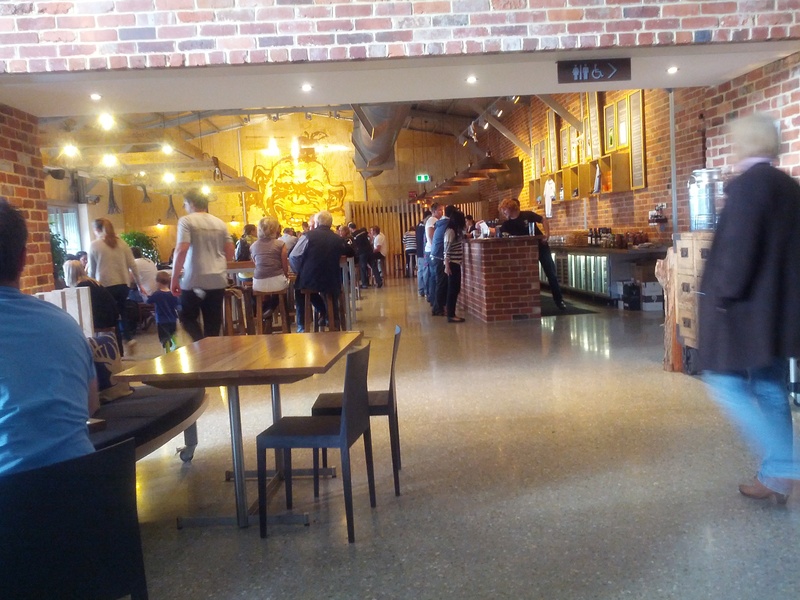 There are a couple of compulsory items when you have a brewery in the South West – 1. A body of water and 2. A children’s playground. I don’t disagree with either of these – both make complete sense, it’s just funny how they have become mandatory items. Cheeky Monkey’s aquatic effort also has a little jetty that seems to attract kids out to stare down into the water. On this particular day it was also the home of just one little duck; we jokingly wondered if we would find that his friends had found themselves as part of the menu. The Cheeky Monkey playground doubles as a landmark; its big and green (didn’t mean to make it sound Hulk-like) and easily spotted as you drive along Caves Road. Its a whole other world in there for the kids to get happily lost in. Yep – that’s one big playground! We hit the bar and were promptly served by a very friendly guy named Rob. 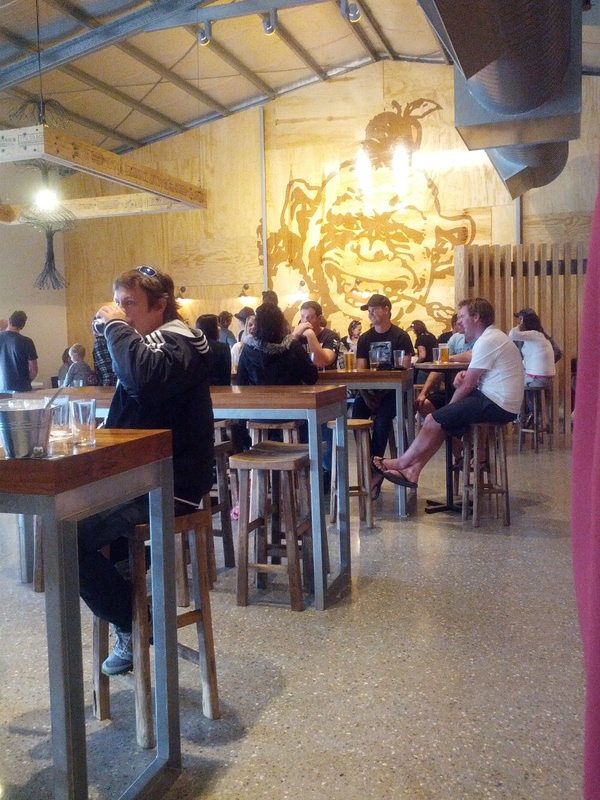 We confessed to being first timers and a good chat about their beers started. I liked that he didn’t default into new-customer-tell-them-about-all-beers strategy, instead asking us about the beers we were keen on trying or wanting to know more about. It was a conversation, not a staff member talking at us. We were going to be having lunch so I decided to start with a Hatseller Pilsner (4.8% abv), made with 100% New Zealand hops, to work my way into something bigger with food. Rob gave us a taster first and we were surprised at the big characters, much more going on than your regular run of the mill pilsner, a characteristic Rob put down to the beer sitting for two weeks on yeast, allowing it to develop more complexity and depth. It had some nice citrus and fruit notes with a strong crisp, bitter finish; I was very pleased with my first Cheeky Monkey brew. My boyfriend drove head first into the Hagenbeck, a 5.8% abv Belgian IPA; although considering he started on Bootleg Black Market IPA I guess it wasn’t that big a dive! Made with Belgian yeast and dry hopped, it was a nice divergence from the mostly American styled IPAs that have been dominating our fridge. There was some nice banana aromas and flavours, spices that I couldn’t quite put my finger on, and strong tropical hops. Like the other breweries I’ve visited recently it’s a service style where the bar is for getting your drinks and there is a separate counter for ordering food. It does mean that the time between ordering your beer and taking a gulp is no longer than 60 seconds but the wait to order food, during peak times, is a much longer. Whilst I am not necessarily an advocate for this style of service, it’s not all doom and gloom as the short wait allows me the chance to look around and absorb other parts of the venue and check out the food specials. I did, however, feel sorry for the customers I saw who had not realised they needed to know their table numbers. I had placed our food order so it was now time to chose our second round of beers. I went for the Traveling Monk – a mid-strength Red Ale, and my boyfriend couldn’t resist the ‘Brewer’s Choice’ Souther Wailer, a Black IPA. It’s the most cheeky of the beers at a belly-warming 6.4% abv, with pronounced roastiness and hop bitterness without drowning out the tropical fruit and citrusy flavours. Having now tried four of the range we agreed the Traveling Monk was our favourite. At 3.5% the Cheeky Monkey’s have produced an ale they say proudly follows in the footsteps of beers like Rogers’ Amber Ale (3.5% amber ale) and other similar styles to showcase that a big abv isn’t a necessity. The Traveling Monk boasts aromas of orange and hops, it’s appearance is nothing short of gorgeous deep amber and flavours of sweet malt, marmalade and fresh hops are delightful. Food arrived and we tucked in to the three dishes we’d selected to share; they were all seafood as we have been doing a lot of home cooking lately, and enjoying every minute of it, so it’s important when we go out we order food we couldn’t make at home. With that in mind we chose the Marinated Fremantle Sardines, Squid with Wasabi Aioli and the Crab Bocadillo. The Marinated Fremantle Sardines were a special for the day that we had chosen because the Chilli Mussels had sold out and it fitted with our seafood theme. 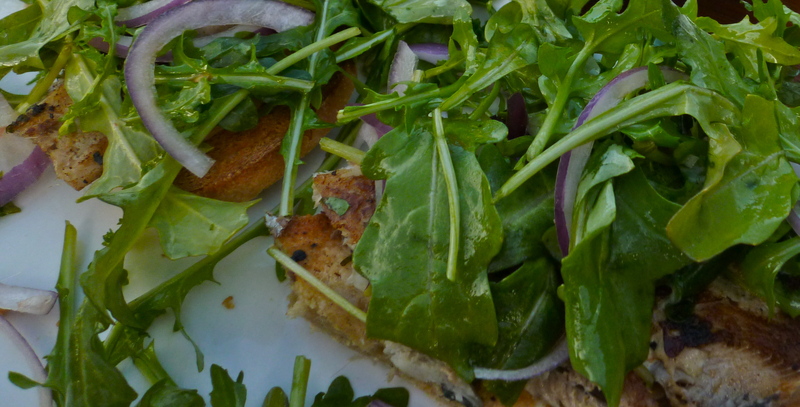 They were beautifully marinated; the sharp flavours of the sardines going well with crisp spanish onion and peppery rocket, served on toasted bread. 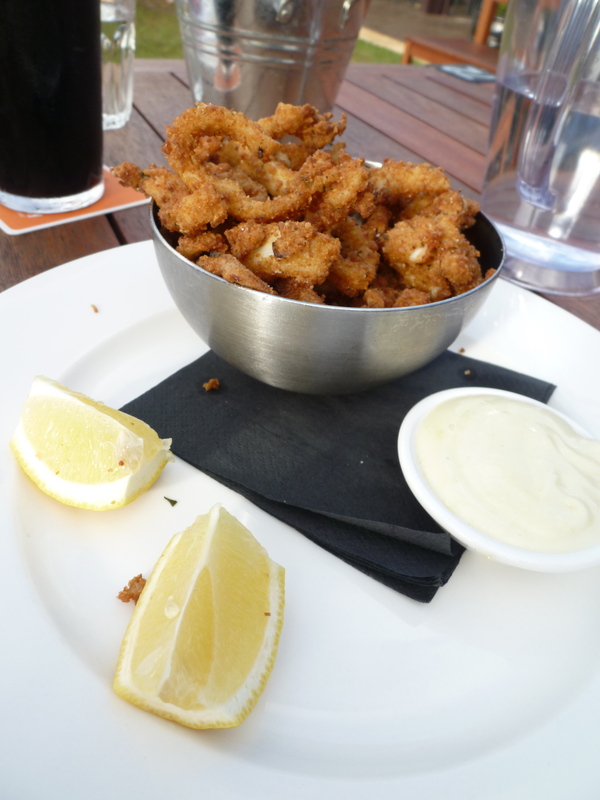 We both love squid and we both love wasabi aioli so it’s probably not a surprise the Squid with Wasabi Aioli was our favourite dish and we would have happily added more wasabi to the mix. Crispy coated squid with fresh lemon squeezed on, I know it’s not an uncommon dish these days but it doesn’t make it any less delicious. The squid was perfectly cooked and it was nice to get two generous wedges of lemon to squeeze. 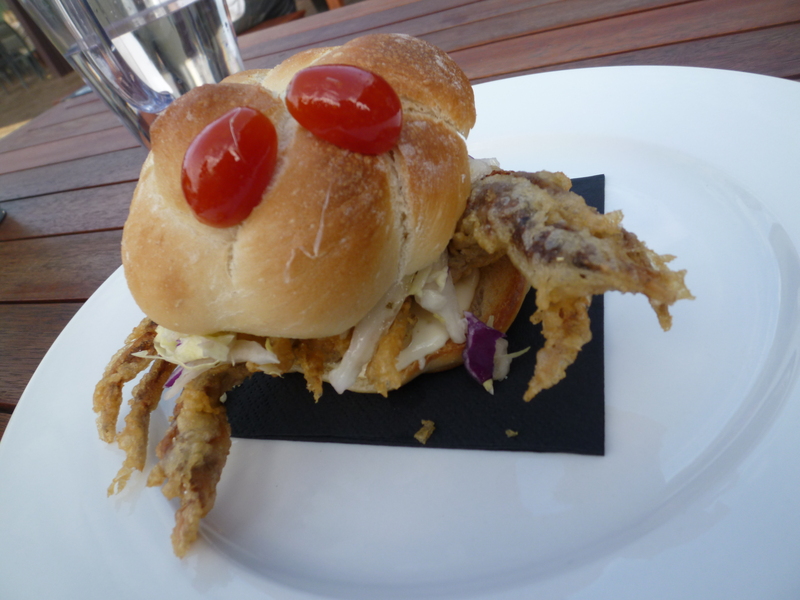 The Crab Bocadillos were interesting with the contrast between the crisp coleslaw and tempura battered soft shell crab. We were comfortable sitting outside and being a couple of big kids and I guess that in itself says a lot about a venue. What also stood out was seeing a couple of kids kicking a footy around and, perhaps inevitably, it sailed up and onto the roof. Perhaps ten minutes, if that, passed before we saw a guy with a ladder prop it up against the side of the building and retrieve it. From where we were sitting it wasn’t clear if he was a Cheeky Monkey employee or just a punter, either way, I think it says something positive about the venue. If he was an employee, to take the time to fetch a kids footy on a Sunday afternoon is pretty decent. If he was a punter I think it’s nice that no manager stormed out shouting things about occupational health and safety (though the ex-bar manager in me might see the situation alternatively ending with incident reports and a set of crutches but that’s mostly due to my own disturbing level of incoordination). Our first contact at Cheeky Monkey, Rob, was knowledgable, passionate and friendly; if you ran a bar you’d want as many Robs as you could get your hands on. They are produced great beers, tasty food and all in a setting with lots of different seating styles for your mood or occasion. 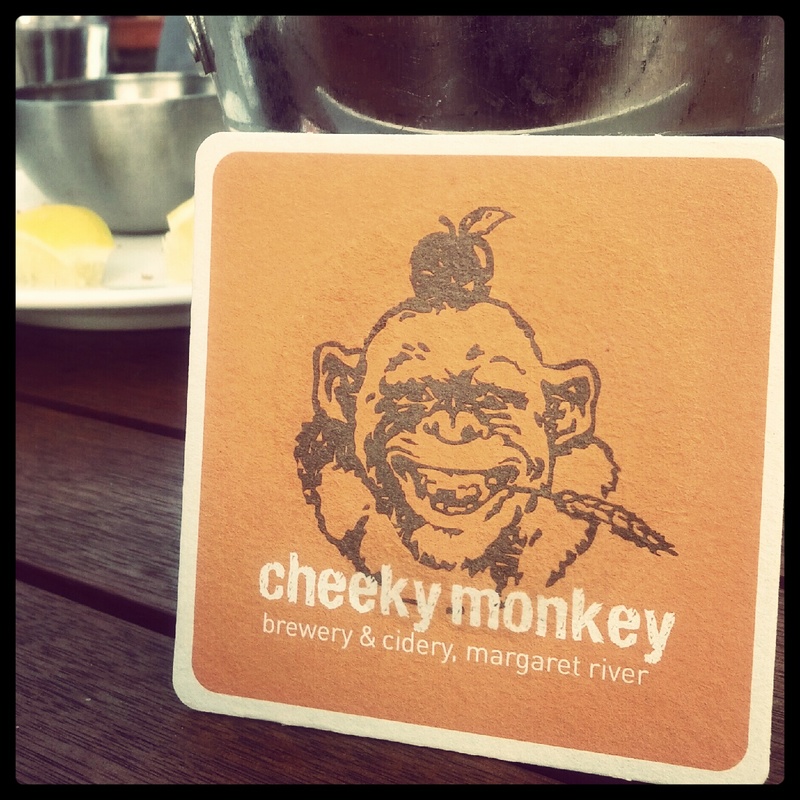 I will happily be going back to Cheeky Monkey soon to try the Pale Ale ‘Old Reliable’ and the ciders that I missed tasting on this first visit. Oh and great name, love the name. Damn.. 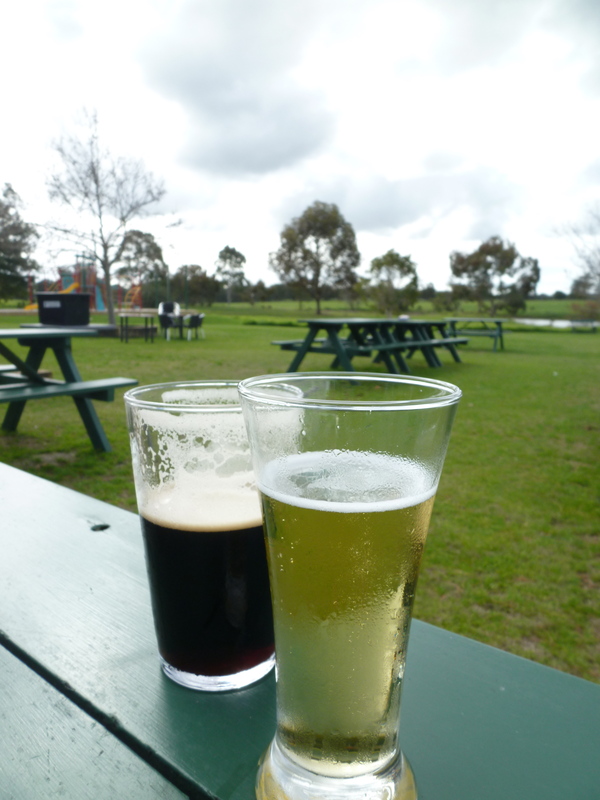 I need to work out how to talk my better half into driving to Margaret River just to try some beers. The Red Ale and the Hagenbeck have peaked my interest, and that squid looks perfectly golden. That’s easy “honey, a romantic winter getaway …” and then it’s breweries galore! woohoo! *piqued. Sheesh. That’s what I get for staying up too late.